After yesterday’s late-night film session, we were tired but full of enthusiasm when we woke up at 5 AM to see the Lumo conservation area. We were split by different interests in to three cars and our dear bus, so everybody was given the opportunity to sit on a window seat. After almost one hour drive we arrived at the gates of the conservation area. One of the green-suited official rangers hopped on to the bus and was very helpful in spotting and identifying the animals. In the conservation area the yellowish dryland savannah was surprisingly full of life despite the dry season and lack of rains. 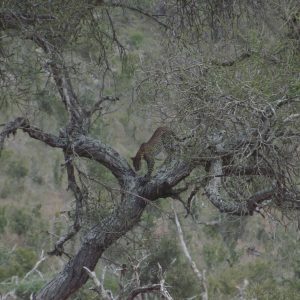 Only some acacias and the waterfront bushes were green, but we managed to see many of the expected savannah species and some unexpected as well. 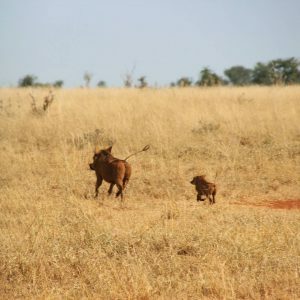 Our skillful bus driver Jackan drove the bus nimbly between the bushes and shrubs, and it did not take long until we saw a wild Pumba-like warthog running around the landscape with three little piglets. This inspired one of the students to make a funny statement: “where there is Pumba, there is Timon,” which was very soon followed by a sight of a small mongoose family. Sadly though, we were informed that the species was not the same as actual Timon’s but that they were just common dwarf mongooses. The most exhilarating animals sighted during the safari included a friendly male giraffe who was munching fresh leaves and did not care a bit of us, two dinosaur-looking secretary birds approaching each other gracefully, a herd of female lions hanging above the trees with their young cubs, and most surprisingly, a rare family consisting of a female leopard and its two babies. We heard that seeing the leopards was so rare that even the safari-experienced university teacher had only seen them once before (and made a shirt about it as a proof). 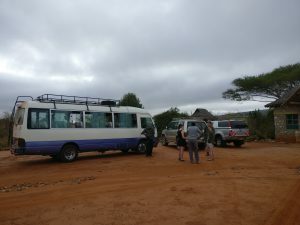 In the Lions Bluff lodge, we had a great lunch and an amazing view over the Lumo and Tsavo areas. Once again, everyone was stunned by the height of Mt Kilimanjaro that peaked the clouds in the distance. Delicious three-course meal cost only 1000 Kenyan shillings (8 euros) and was quite a luxury after some tough days of small snacks. It was also pleasant to hear that the resort was managed by the local community and that the items sold in the gift shop were produced locally. Some students were so thrilled with the lodge that they agreed to spend their after-graduation holidays there. After the lunch break, we were headed towards the farm of Mwadime in the Maktau village, our helpful station foreman. At the farm we were warmly welcomed by his numerous family. His wife Jennifer, relatives and children greeted us with hugs and handshakes, and they even offered us tea and local pastries. Mwadime introduced us to his agricultural production and to the measuring devices used in many research activities that are taking place around his lands. 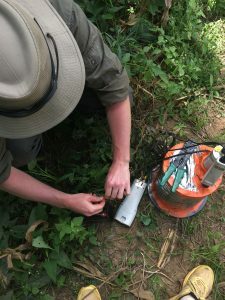 It was interesting to hear about the precipitation surface experiments and carbon dioxide flux measurements that were both set there to give data about different environmental factors affecting the local agriculture. 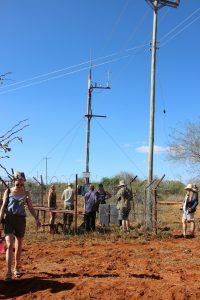 For some students it was also the first time to see a carbon flux measurement tower, the function of which was well explained by the Chancellor of University of Helsinki who is a professor of aerosol physics. In the evening we all enjoyed the last dinner together with the station staff outside in the lanterns’ light. It was a perfect ending for an almost-fortnight of physically demanding excursions and field work in the mountains and the surrounding areas. Today was the last of our three hiking/forest days and the location was none less than the famous Ngangao mist forest. 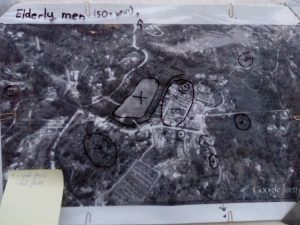 Most of our university’s geography students may have heard at some gis-courses about the research done at Ngangao and possibly have seen aerial pictures taken by our university’s research groups. 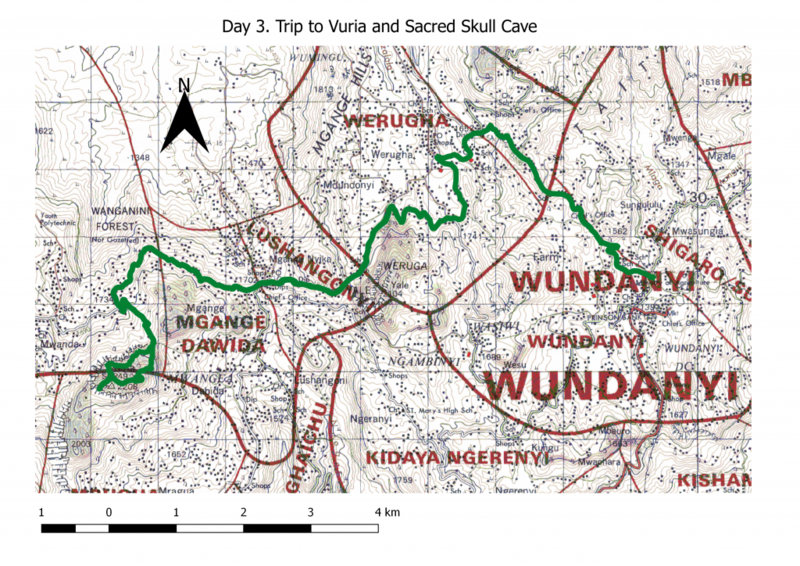 The forest is located about 10 km from Wundanyi and is one of the considerably well preserved indigenous forests in the area with about 124 hectars of indigenous forest (Pellikka 2009). After hearing so much about the area it was really interesting to actually experience and see it ourselves. This time we didn’t have any spesific assignment for the trip and we focused just to enjoy the forest and the environment. 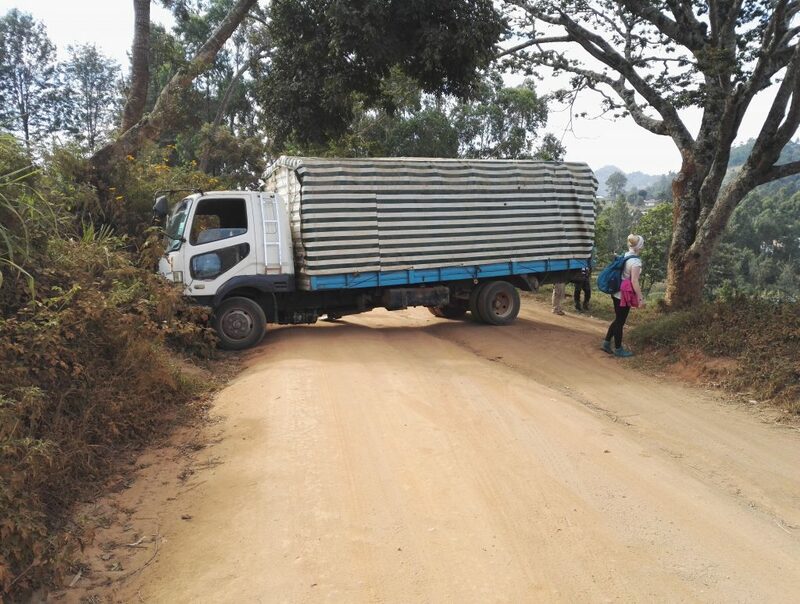 We confronted minor setbacks on our way to the forest when a truck was stuck sideways on the way of our bus so we had to walk from a bit further away than planned. Also our course assistant Petra had to leave to the station early because of a foot injury. Other than those the trip was a success and because of the extra walk from the bus we actually got to see some monkeys hanging on the trees on the way. 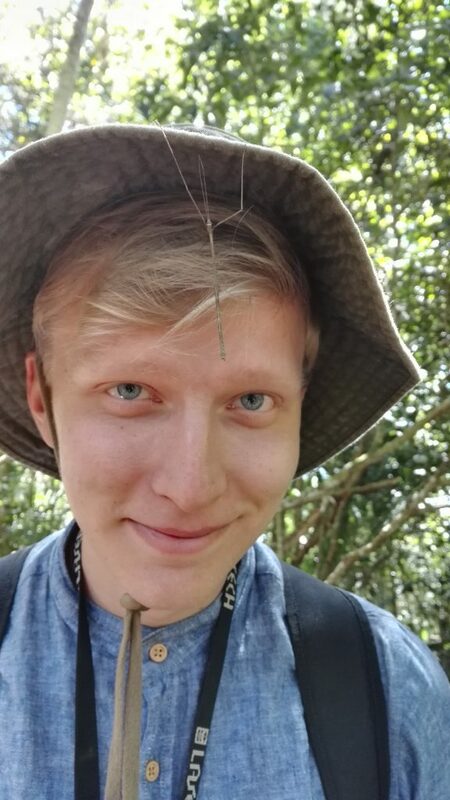 The terrain was also quite a lot easier than at Vuria or Kasigau and the weather in the shady rainforest was nice and cool so the day was really relaxing and a nice ending to our forest hikes in the area. Of course we weren’t totally idle and we learned a lot about the species and the situation in the forest from our own professor of biology Jouko Rikkinen, stations research assistant Darius who knows everything about the local flora and also from the forest rangers who lead us around the forest. The chancellor of the university of Helsinki, Kaarle Hämeri, who joined our fellowship after the TAITAGIS kickoff, also shared some of his knowledge about the athmospherical phenomena. 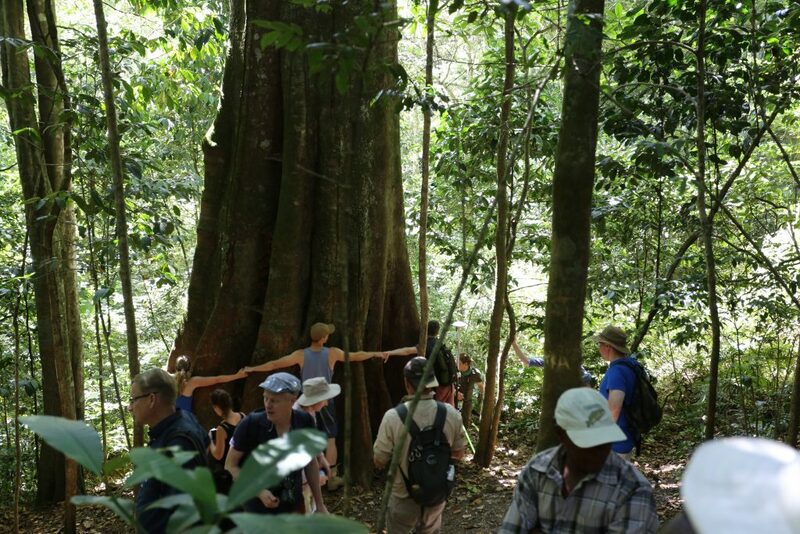 Our first stop was at the biggest and propably also oldest tree in the forest (in the picture) which was about 6 geographers and one geologist in diameter. Next we continued through the forest exploring also the exotic pine areas where the indigenous forest has been totally perished. Near the other end of the forest we had lunch at an open rock, again with a spectacular view with mount Kilimanjaro in the distance. After lunch we went to check out some of our university’s research equipment in the forest (rainfall collectors, moss moisture collectors and iButton Hygrochron temperature and humidity loggers for example). From there on we walked back through the forest to the bus, occasionally stopping to wonder the great trees and plants in the forest. After we had been driving away from the forest for a while our research assistant Mwadime shouted to stop the bus and noted that ”We have left our chancellor behind!!”. Fortunately this was not the case, the chancellor apparently just had some extra energy left and had decided to run back to the station. When we arrived to the station, the chancellor was already waiting for us (to our defence, the mountain roads weren’t in very good condition!). The rest of the day we spent relaxing in the station saunaing(??) and preparing for tomorrows safari trip! Pellikka, Petri & Lötjönen, Milla & Siljander, Mika & Lens, Luc. (2009). 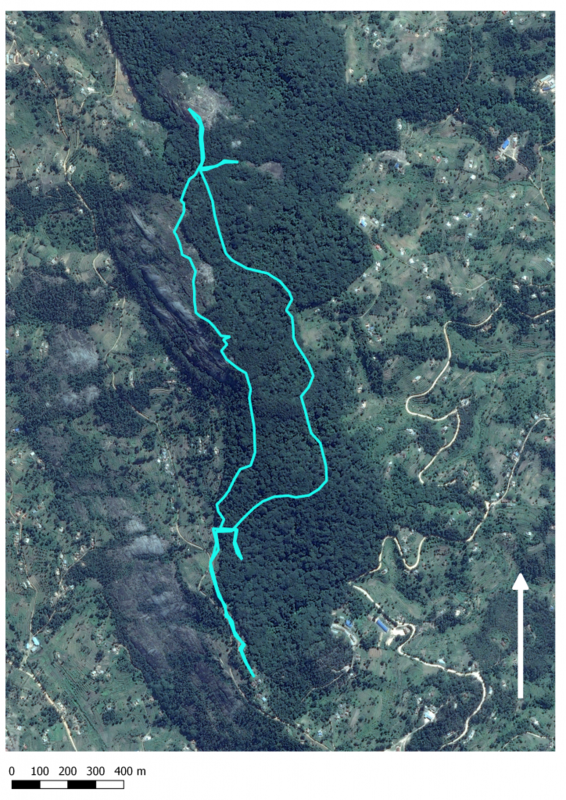 Airborne remote sensing of spatiotemporal change (1955–2004) in indigenous and exotic forest cover in the Taita Hills, Kenya. International Journal of Applied Earth Observation and Geoinformation. 11. 221-232. Another day with the field work started gloomy and cloudy. Starting the day was easier than yesterday, because everyone knew what was going on. 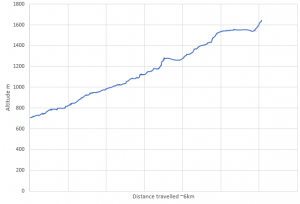 Today we did a transect with 10-meter interval. 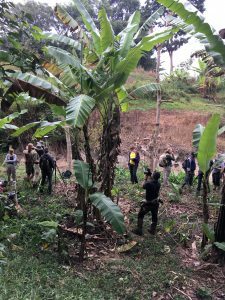 We started near team bananas plot, continued first on the same side of the stream and then crossed the dam to the stations side. Using the same measurement tools as yesterday team took measurements from 21 randomly selected sites. Film maker Toni was with us and interviewed some of us for his upcoming document. We are excited to see how is it going to be like! 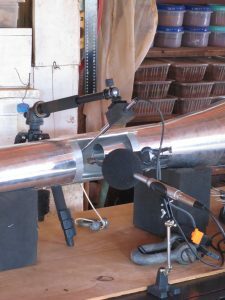 Everything worked well, and the team seemed to know how to use all the instruments. On the other hand, Aleksi torn apart a banana tree and sunshine sensor didn’t work due to lack of sunshine. All and all it was a good day and we made some good measurements. Our first actual field work day took place near the research station, where LUOMUS (Finnish museum of natural history) are planning to build botanical garden. 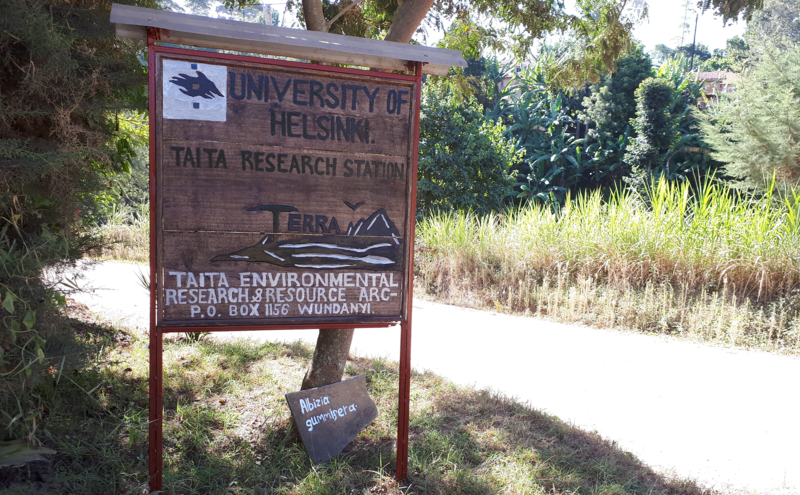 Main goals for the day were to practice the usage of different measurement tools and to get a picture what kind of research could be done in Taita area. It would also be pleasant surprise to get some good results, which we could forward to LUOMUS. After a short of hassle in the morning the group, me and the measurement tools ended up to their right places. We separated into three groups, team banana got their place under the banana plants, team maize got place in the dry maize field and team natural got place in thicker forest that was partly indigenous. Assistants went around these three spots with the equipment and demonstrated how they work, so everyone got to participate. Tools we had contained variety of instruments. Sakari demonstrated how the hemispherical photography and positioning with Trimble and hypsometer worked. Aleksi demonstrated how the clinometer, Specim IQ and chlorophyll meter worked. I myself showed how the soil respiration, moisture and temperature was measured and how sunscan worked. We took some soil samples and tested the its infiltration. Before noon I worked with the team banana. Everyone was little tired but curious about the instruments, so measuring started well. Our ornithologists were excited about birds and the stream gurgled nicely. Even the heat didn’t bother us under the banana leaves. 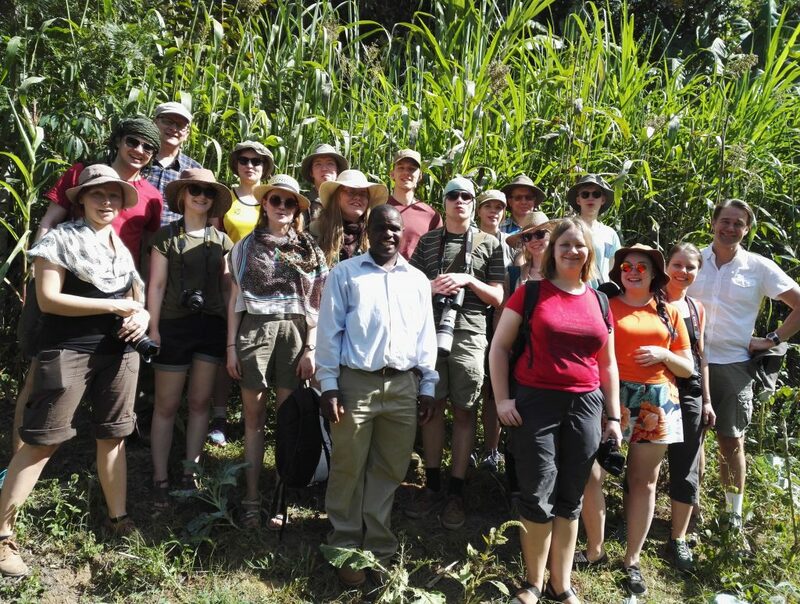 In the maize field some of the team members experienced a small sun stroke. Despite the heat the team was doing fine with little help from the local girl called Saru. The battery that gave energy to the fans in gas chamber died suddenly so handy AP fixed it and measurements were finished successfully. At team natural’s point you could tell it was already late and everybody were more or less ready to loose off. Measurements went without any problems, even thought Maiju, whom was terrified by hard science, hid under a leaf. As we left from the site we tried to clean the surroundings by taking some littered batteries with us, like any good citizen would do. Surprisingly, all the groups were ready almost at the same time and headed back to station, where we had well deserved dinner and sauna. Today we had a small introduction to participatory GIS (P-GIS). The main idea is to apply GIS methods without digital devices and report the results back to the community so that the people have access to the data. We will shortly clarify the methodological background behind P-GIS, experiences from the practical exercise and the main results. Participatory research has evolved during the last decades. It started in 1970’s called as ‘Rapid Rural Appraisal’. The main idea was to question positivist perspectives to field research that included top-down approach. The scientists aimed to abandon preformulated questions and tried to learn from locals instead. This represented the general change in development thinking in the field of geography. In the 1980’s the focus turned more into methods, attitudes, behaviour and sharing. The focus was more in the local interests and they were more involved in control, use and analysis of the research data. Importantly, facilitators were in charge of conducting the field research that had not been self-evident in the previous decades. In order to understand the research situation holistically, the focus turned also into gender, power and other socio-economic factors. In the 1990’s perspective turned from rural to more general concept, hence the name ‘Participatory Learning and Action’. The new focus was to emphasize the awareness of the community instead of amount of information. PRA is considered as a tool for change, empowerment and increasing awareness and skills. Ideally, P-GIS is a way to break the language barriers between academics and locals for the phenomena that cannot be studied otherwise. 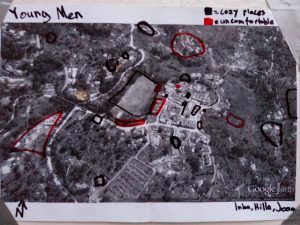 The aim of the practical exercise was to spatialize cozy places and unpleasant places in Wundanyi area. The target groups were adult women aged 18-50, adult men aged 18-50, elderly women over 50 years old and elderly men over 50 years old. Each student group interviewed one participant group so that both groups interviewing men had at least one male member. 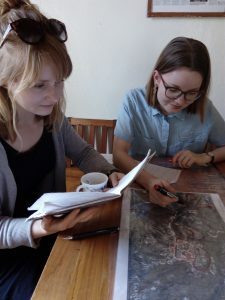 Participants were asked to identify locations, which they found pleasant and unpleasant either as points or polygons on the orthographic map. Each group interviewed ten persons individually so that every target group was represented. Interviews were combined together as per target group to represent the experiences and views about Wundanyi town. Produced maps will be placed in the local library so that everyone will have access to them. After the interviews the results were discussed and presented for the student groups. The main finding was that women aged 18-50 found social places such as market place and football field the most pleasant because of the possibility to meet family and friends. The second most pleasant places were workplaces and also the importance of climate and nature was mentioned. 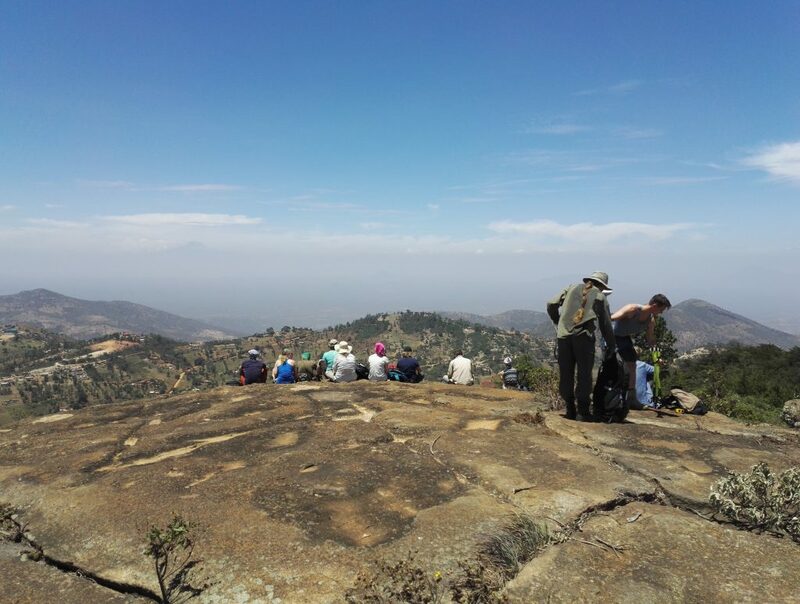 As for the unpleasant places, people were significantly more reluctant to talk about them but rather Wundanyi was considered as a perfect place for living. Only two women mentioned hot places and too crowded football field as unpleasant. 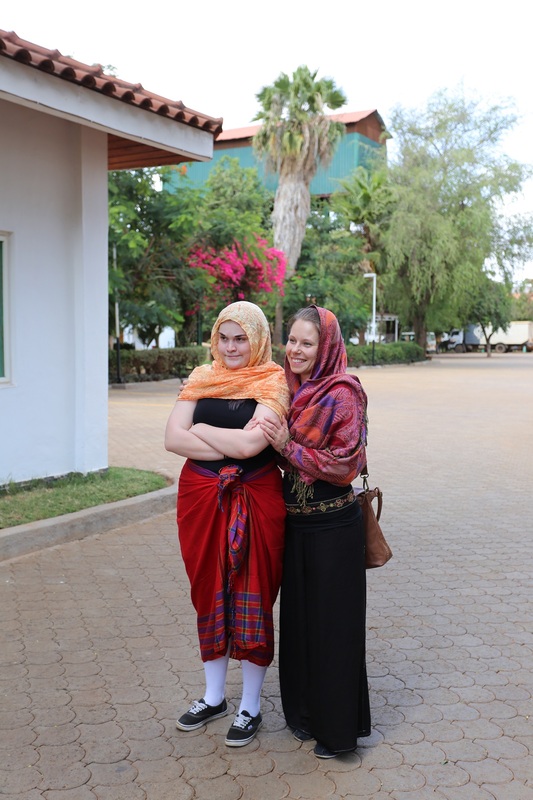 After some interviews, it was brought out that women do not go to the center in the evening or in the night time at all so the time was a relevant factor. Elderly women found homes to be the most comfortable places. They also enjoyed market places, church and some other practical places. Market place was also mentioned as unpleasant place because of the noise. Otherwise elderly women were reluctant to mention any unpleasant places. Young men liked the places where one can hang around such as the market, football field, gas station and bus station. They also appreciated climate and green nature. As bad places they mentioned sanitary and sewage problems around the town and a place known for drug usage. Elderly men appreciated forests and hills more over market places. They praised Wundayi for its climate and nature and possibility to get whatever one needs. Homes, hotels and working places were also mentioned as good places. Football field was also seen as a political place for big gatherings. In line with other responses, also elderly men fund Wundayi as a good place for living. For elderly men the map was the most interesting part of the interview event though they were the only group that did not want to draw on the map. As a conclusion some general aspects common for every target group were language barriers, hospitality bias and a lack of map reading skills. The lack of English skills of some respondents caused challenges in communication. Unwillingness to mention any bad places could be explained as hospitality bias that refers to peoples’ politeness to only discuss positives aspects of Wundayi. Some respondents found it difficult to orientate and read the black and white map. Also, the student groups’ unawareness of the area hindered the ability to locate some of the mentioned places. The empowering participatory aspect of P-GIS allows a stronger engagement with the topic in hand. At the end, all the students enjoyed the exercise and agreed on the important perspectives that P-GIS has to offer. The fourth day was the most demanding but possibly also the most rewarding day so far. 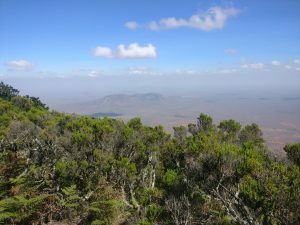 We hiked to the top of Mount Kasigau – it took 8 hours and we climbed approximately 900 meters to an altitude of 1600 m. The route itself was 12 km in total, although it did feel like a lot more. During the hike, we observed the changing environmental conditions and vegetation along the increasing altitude. The task of the day was to stop once every 50 m (in altitude) to map the vegetation type, soil moisture and human influence. 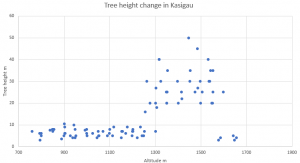 From vegetation we estimated the height and diameter of the tallest tree, presence of Dracaena trees, succulent plants, ferns and epiphyte moss. Two groups also tested a hypsometer which is used to measure the height of a tree. 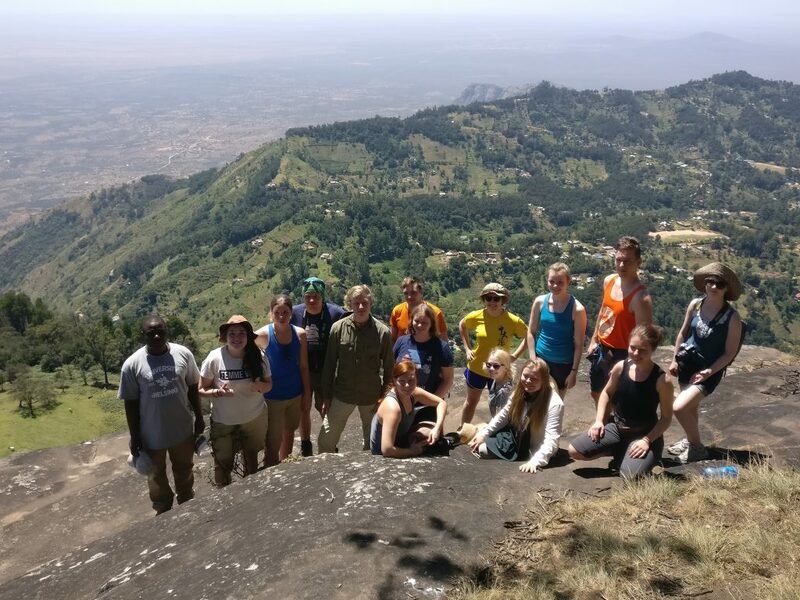 The changes in environmental conditions were clear when climbing to the top of Kasigau. At the bottom of the mountain, the vegetation was rather dry woodland with several trees scattered around. Quite soon the vegetation got drier and the trees scarcer. This is the beginning of the dry season, so the top soil was rather dry and there were no signs of fern, moss or Dracaena trees. However, succulent plants were quite common as they can manage in much drier conditions than the other plants that we observed. In about 1000 meters the vegetation quite suddenly changed to greener and denser and the trees got smaller and more bush-like. This type of vegetation continued up to the ridge which we reached in about 1300 meters. 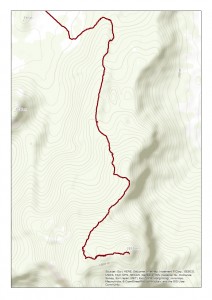 The beginning of the ridge also offered a good mid-way resting point and a chance to eat something. The narrow ridge continued south-west rising very slowly. Midway through the ridge the vegetation started to look more and more like a forest. The trees started getting taller with Dracaena trees in between. There was also a slow change towards cloud forest which is visible for example from epiphytic moss, taller trees and wider tree trunks. These started showing up at an altitude of 1200 meters. Ferns started showing up only quite high up, in about 1400 meters. The cloud forest continued until almost to the top where the vegetation got drier again. The trees became smaller and changed to conifers which surrounded our final stop and lunch place. Today started early when we took the bus to the bottom of the mount Vuria. The bus ride was a memorable experience with steep slopes and narrow serpentine roads. The higher we drove, the better the views became. At theend of the road we started walking to the starting point of the nature path. The goal of today’s exercise was to confirm the vegetation classification of Hari Adikari’s GIS data. We marked the points in the GPS devices by 15 m elevation distance and classified them according to FAO land use classification system. The most common classes we saw seemed to be indigenous and mixed vegetation. 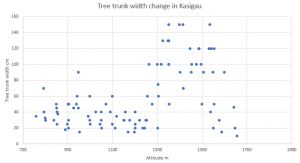 Professor Jouko Rikkinen and our local research assistant Darius introduced us the most common indigenous and exotic woody species growing in the area. Soon, we were able to identify the easiest and most characteristic species such as the Acacia mearnsii and Lobelia gibberoa. 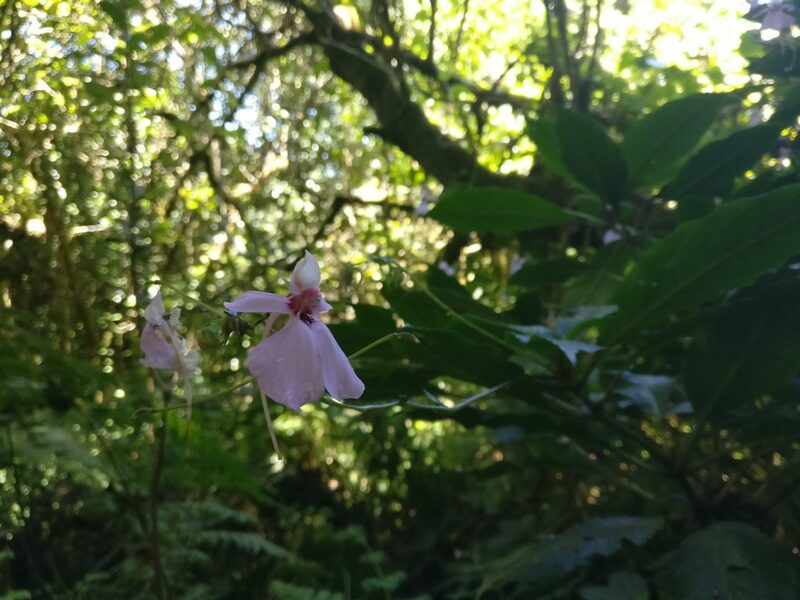 Also, we saw two of the endemic species Impatiens teitensis and Bruceae antidysentrica. It was interesting to see the change of vegetation composition while we climbed up. First, we saw agroforestry and mixed forest with both local and exotic species of economic importance. When we reached the elevation of around 2000 meters the moisture content seemed to increase which was indicated by the abundance of the giant fern Cythea manniana. There were also some small water paths surrounded by different mosses. Also, we were surprised that even at that altitude there were grazing cows as well as some local cutting firewood. 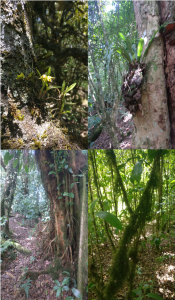 At around 100 m higher there were local epiphyte orchids, and small wetlands with thin peat layers. When we reached to the top, the moisture content decreased and there was a dramatic change in the flora. Instead of the jungle-like forest, there were lots of Ericacea shrubs growing on top of rock surfaces. 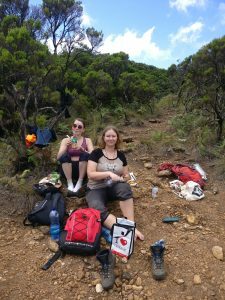 We had a well-deserved snack break with a breath-taking view, and we were even able to see two peaks of the Mount Kilimanjaro rising above the clouds. After returning to the start, we were taken by the village chief to attend the sacred ritual of the local people. The villager men prayed and drank and spitted a special liquid. We were divided to different entrances by gender. The elderly women greeted us happily and showed us the ugali, traditional maize porridge, they were cooking in open fire. 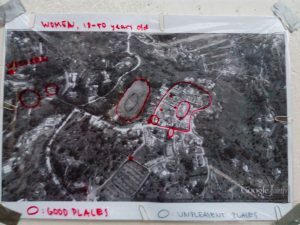 There was some confusion of whether the female-assigned students could attend, but after discussion we were let to go in the conditions that we took a two-meter distance to the sacred area. 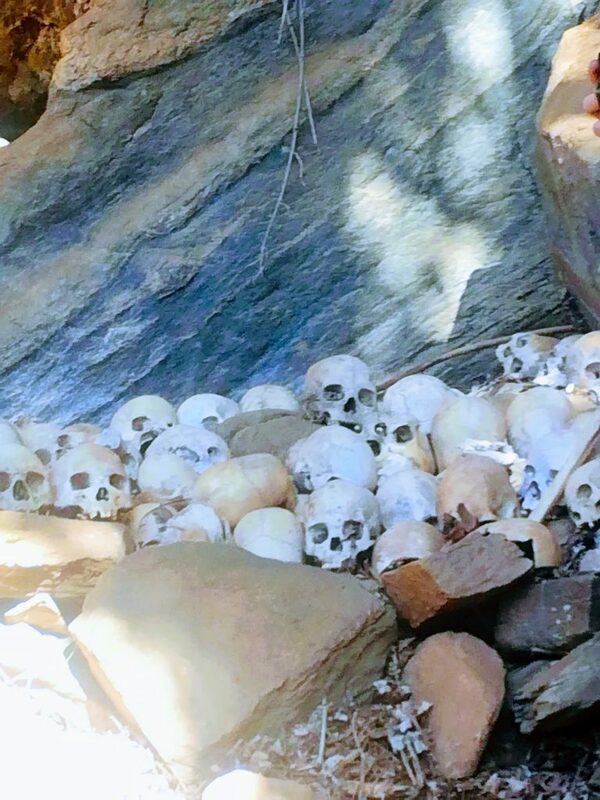 As an unpleasant surprise we had to take our shoes off and walk barefooted across the sacred forest to a cave full of human skulls. We were told that the oldest skulls were from the 16th century. The skulls were collected from the graves of the important old men six months after their burial. The whole ritual was impressing but provoked a lot of discussion regarding to the relationship between traditions and gender equity. 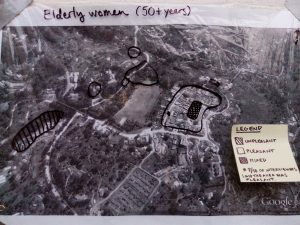 Women and men were separated, and men were able to do the ceremony, and drink home-brewed beer while fertile-aged women were expected to cook and wait. In conclusion the day was both demanding and rewarding. We were able to learn about nature, culture, and research in practice. At 8 o’clock we were supposed to meet the elders of nearby families. As they were suddenly detained, we instead heard of the wonderful medicinal uses of ricin plant, and also of its horrific purposes in the biological warfare. We also had the chance to see the Taita White-eye Zosterops poliogaster ssp. silvanus, wonderful little bird endemic to Taita Hills and Mt. Kasigau. First stop of the day, sisal-plantation was a nation of its own: in the middle of its fields there was a small village with all the social facilities including post, school and church for the workers. The plantation indeed provides its workers with economical sustainability and security, perhaps thus discouraging them from leaving. We met with the son of the manager, Jason Collette, who gave us a comprehensive tour of the premises. He told us that we were on the largest sisal plantation in the world, employing 2000 workers and providing housing for 5000 people altogether. 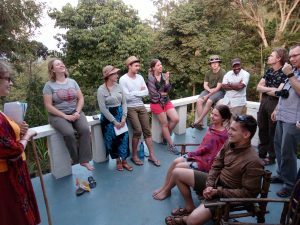 One of the themes of our field course, water balance and land use changes in Taita Hills, were brought up. Mr Collette had also noticed the dwindling of the water resources in the past 17 years. Nowadays the farm has started to rely on wells over 200 m deep. The tour on the sisal fiber factory was very informative and included a fiber treatment waste pile that had been burning for over 30 years, and a factory tour. The waste pile boasted a quite wide range of interesting birds, for example a Spur-Winged Lapwing, Vanellus spinosus. Lastly, we discussed the GIS-applications that could benefit the plantation and how the University could use the plantation in their calibrations. 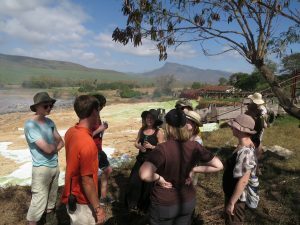 Our group pondering the implications of the sisal waste pile. We drove to the Sagala lodge, where there were German termite specialists and a pool. After a quick poolside refreshment, we learned about the whistling acacias. Ants might be the ones making these trees whistle, thus telling the herbivores to stay away. This adds to the interesting symbiosis of the plant and its keepers. 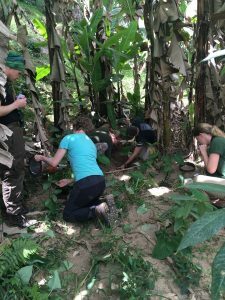 We also learned about the newest advancements in bee-keeping and social patterns of bees and termites, and visited a termite nest. 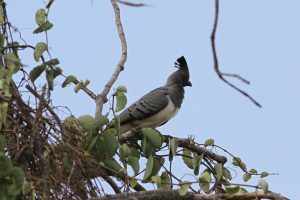 From the tree on the lodge’s yard watched us a delightful White-bellied Go-away-bird, Corythaixoides leucogaster. Our last stop was a visit to the Wildlife Works station. 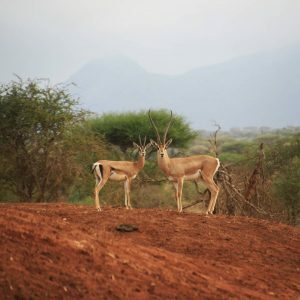 Established in 1997, Wildlife works is a part of the REDD-project in Kenya, which aims to reduce emissions from deforestation and degradation. They wish to achieve this by consumer-powered conservation methods. Gaining funds by selling carbon credits, they use the money to reduce harmful charcoal burning in the area, while also providing safe passage for the elephants to pass from Tsavo West National park to Tsavo East. They are also included in guarding the forests and providing work for the women of the area. They also provide education for all age groups and seek to entice the community by participatory projects, such as theatre, sports and community meetings. Our group was very enthusiastic supporting their cause when visiting the Wildlife Works factory gift-shop. Our group was also enthralled about d’Arnaud’s barbet, Trachyphonus darnoudii. The first day at the station we spent by getting to know with Wundanyi and the station area, and by visiting some local officials and local people. 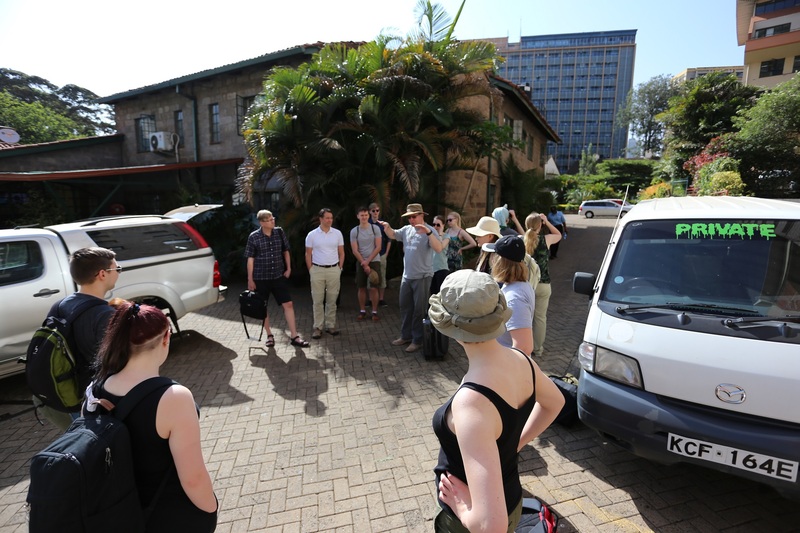 The day started by walking (after delicious breakfast at the station) to the Taita forest service office, which is located quite near the station. However we managed to be late from the appointment because of all the interesting fauna and flora on the way (obviously we had to stop several times to take pictures and listen to interesting lectures about them). At the forest service office the assistant county forest coordinator told us about the forest management in the Taita region. We learned a lot about the situation of the regional forests, waters and soil and for example what kind of effect exotic species and climate change has to them. 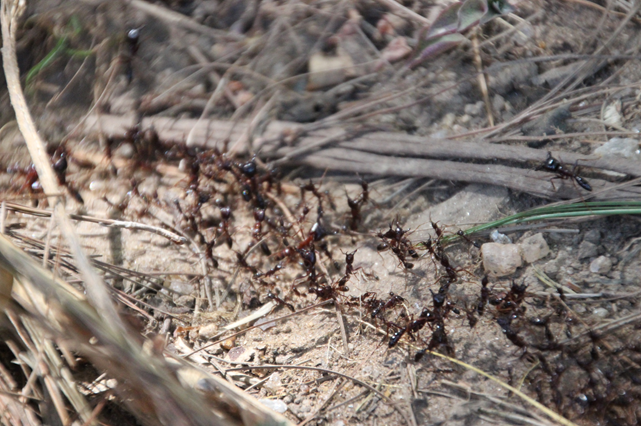 Army ants on the track to Taita forest service office. After that we continued to meet the Taita subcounty commissioner, Francis K Kazungu to deliver some research permission papers and at the same time we got a short and informative lesson about the governance systems in Kenya. 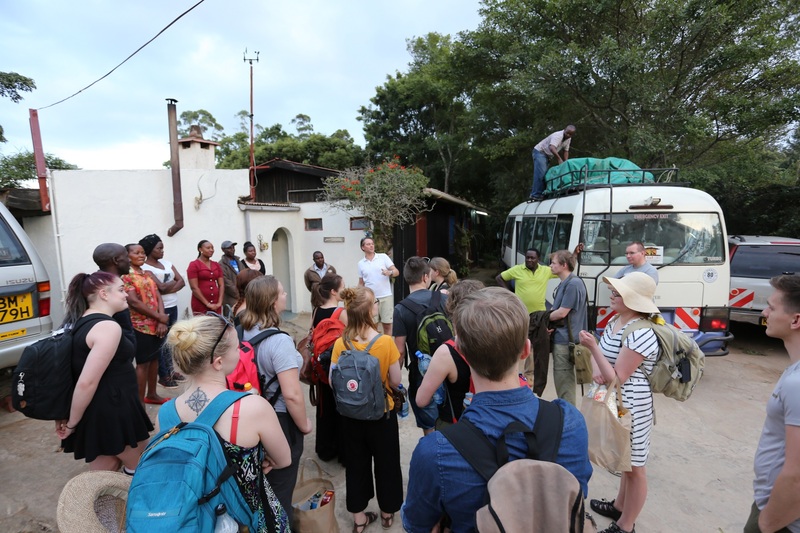 Next we visited a non-governmental organization, Taita Taveta wildlife forum and Dawson Nyumba, from whom we learned more about the local trees, plants and farmers. We were told that some of the main problems are the reduced water resources and loss of biodiversity. The organization trying to get the farmers to plant indigenous trees and plants, but are facing a lot of problems convincing the farmers of the long term profits of using them. Mostly because the farmers need short term economical profit to feed themselves and their families. Focusing to this important and interesting lecture was however partly difficult because of the cute and curious monkeys on the nearby trees watching us and occasionally throwing some small sticks and half eaten fruits at us (mostly at Petra). Dawson from the Taita Taveta wildlife forum giving a lecture. 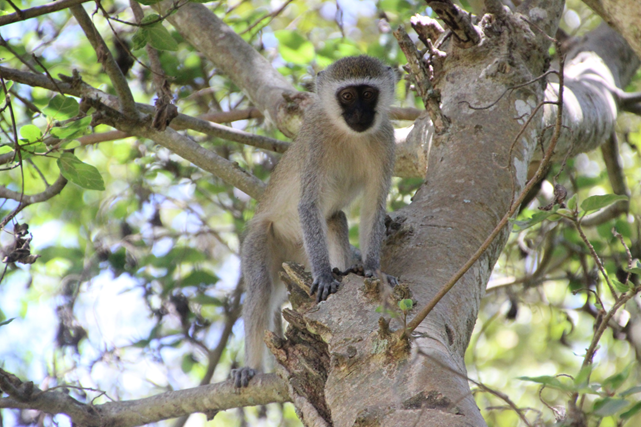 Curious grivet also following the lecture. After meeting with the officials and forest management people, we moved to see actual farm and plantations at our stations research assistan Darius’ farm. Darius introduced us to his home and family and gave us a interesting tour around his plantations. The relatively small farm consists of a few cows, chickens and variety of trees and edible plants from bananas to eggplants on several terraces of crops. 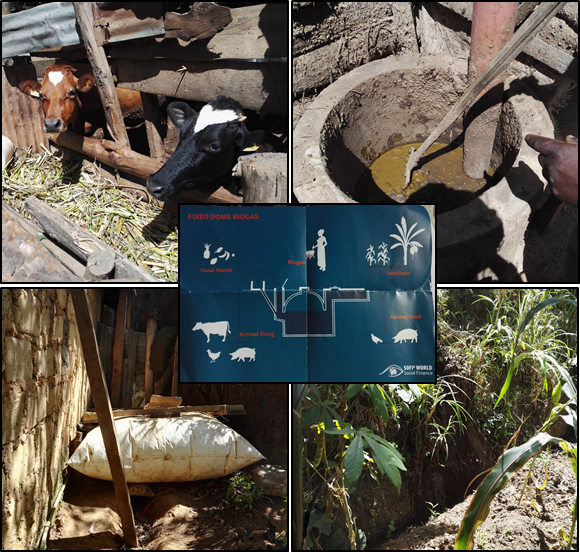 From the dung of the cows he produces biogas to cooking and the residual is used as fertilizer for the crops. Biogas producing system – From manure to biogas and fertilizer. 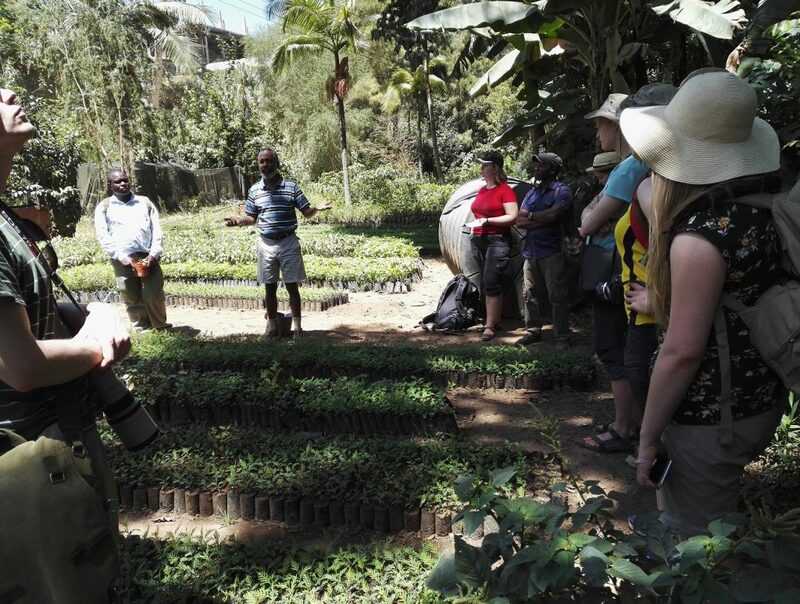 Later we got familiar with the Wundanyi center and markets and also with the proposed botanical garden area next to the research station. After eating a well deserved dinner at the station we got to use the great sauna of the station (build by a finnish taxidermist/sauna building expert at Kenya). The day was full of plans and a lot of new information to process, but still we found (made) time to explore and wonder the surrounding nature and environment. From time to time it was hard to concentrate on the on going lectures and topics with so much disturbance and interesting activites around us (e.g. monkeys hopping behind the lecturer and throwing stuff at us, numerous birds flying around…). 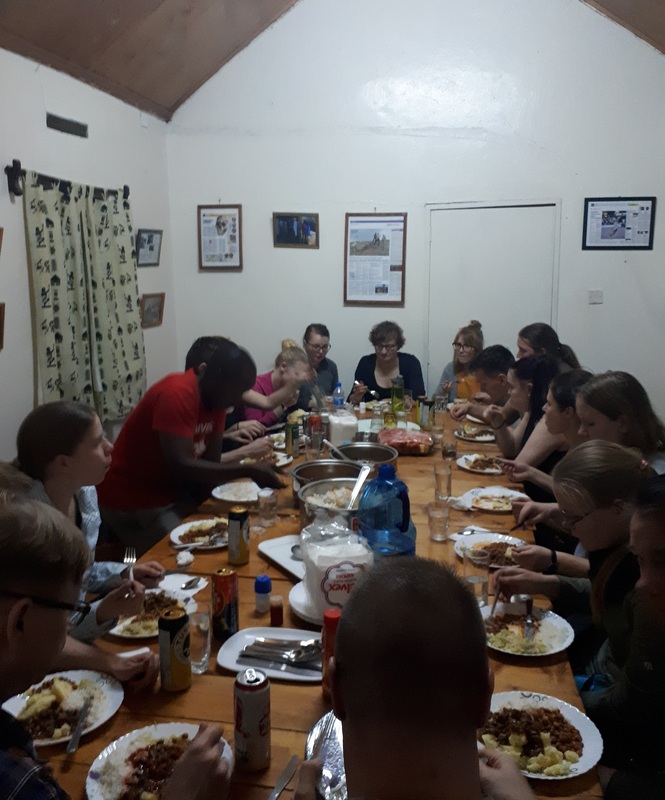 All and all everything has been great, locals and the station staff have been extremely nice and we have already learned so much on our first day at the Taita Hills! Field course group and Darius. 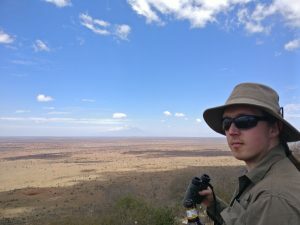 The purpose of this blog is to document, describe and share activities undertaken on the Taita Field Course (30.1.2018 – 11.2.2018). Preliminary sessions for the course were organized between November 2017 and January 2018, and followup sessions will be organized in February 2018. 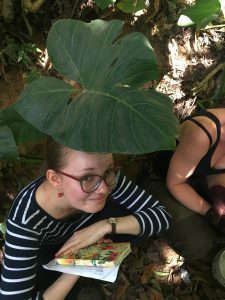 This blog only covers the field work part of the course. 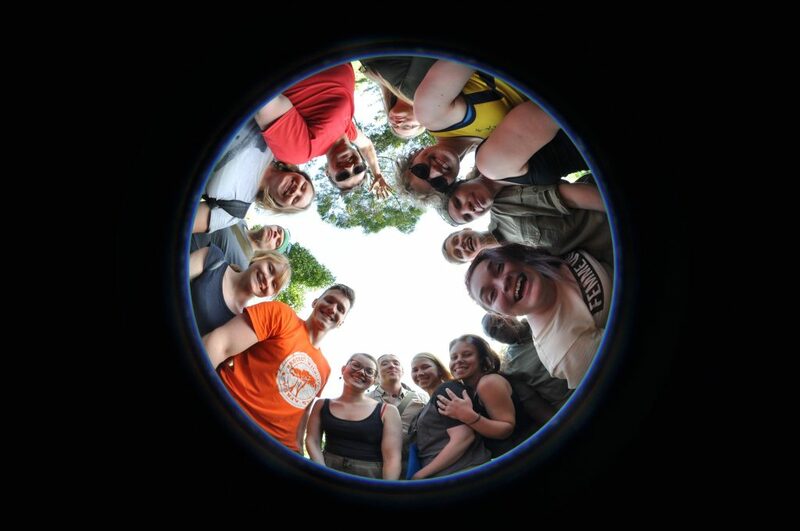 The course is a part of Geoinformatics Masters Program (University of Helsinki), with a total of 15 students. Twelve of us major in Geography. 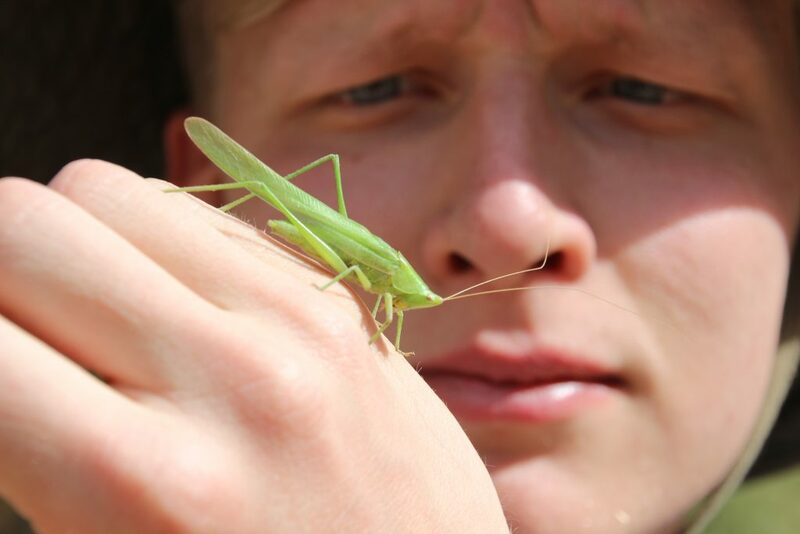 Additionally, singular students of Forest Sciences, Biology and Geology participate on the course. Prof. Pellikka, Rikkinen and Phd. Johansson form the teaching staff of the course, so our group totals 18 finns. Fieldwork is mostly undertaken in pairs of students. These working pairs also take daily responsibility of updating the blog. Feel free to make questions and comments or share this blog during the course! Students and teachers flew on three different airlines, departing from Helsinki between 7 and 9am on Tuesday 30.1. 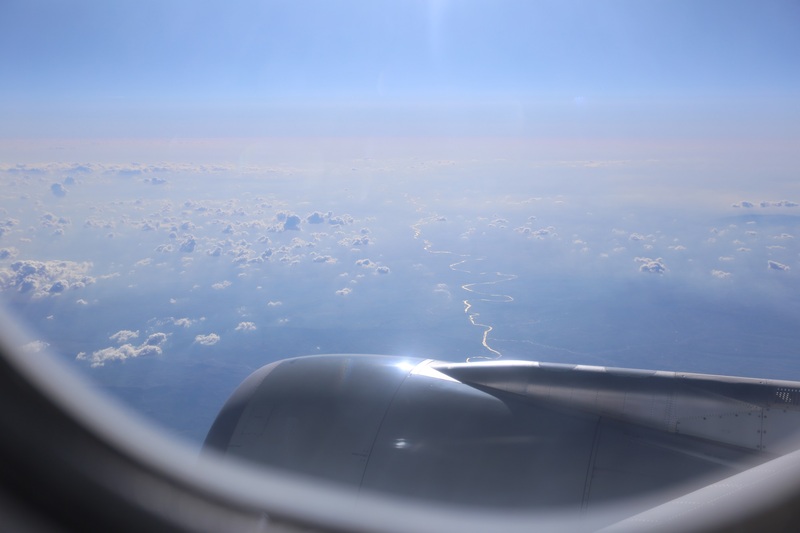 Flight time (including intermediate landings) varied between 12 and 14 hours. Flight logistics worked out suprizingly well, since only one of the flights was a couple of hours late. The arrival night was spent at Anglican Church of Kenya Guesthouse in central Nairobi. Accomodation was very pleasant, including warm shower and abundant breakfast. The last student group arrived at ACK guesthouse at 3:30am on Wednesday. The drive from Nairobi to Taita Hills via the town of Voi went very smoothly despite heavy traffic. After midday we stopped for a short lunch break at a Sikhi temple in Makindu. Religious practices required us to cover our heads during the dining. The vegetarian food at the temple was excellent and essentially free of charge. Our satisfied group left donations of 200-300Ksh (3-4 euros) per person as a token of gratitude. Even though sleep deprivation was a common inconvinience among us students, interesting scenery kept most of us awake during the drive. 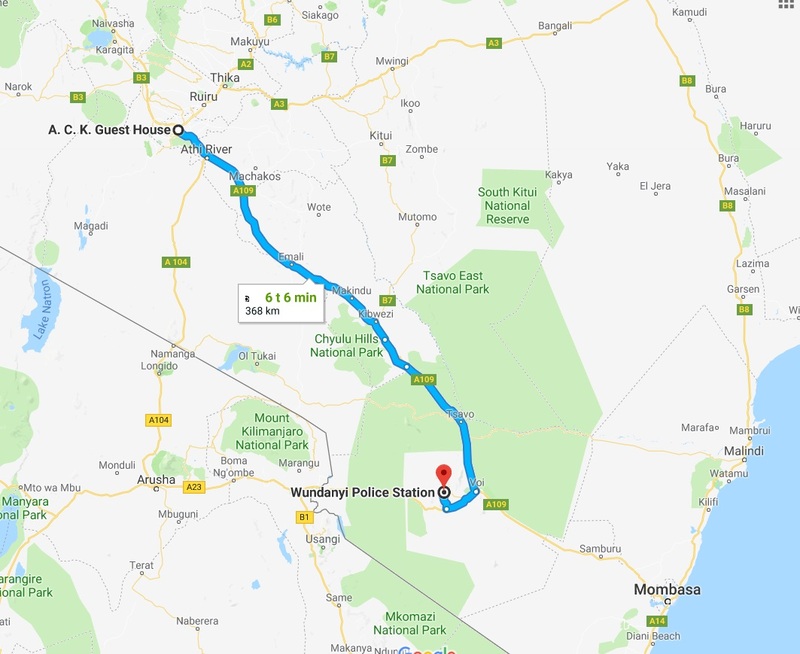 The highway lies next to the newly built Nairobi-Mombasa railway line, which is expected to have a major impact on traffic flows in Kenya and abroad. Dozens of new railway bridges, embankments and station buildings highlighted the magnitude of this infrastructure project. For physical geographers, variation in climatic conditions between Nairobi and Taita was interesting to observe. 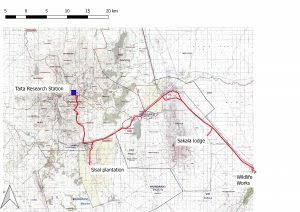 Nairobi is situated inland and at an elevation of approx. 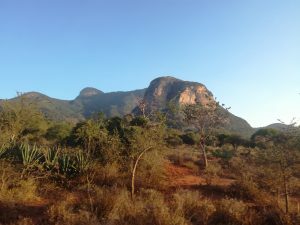 1800 meters above sea level, while Mwatate (Capital of Taita-Taveta County) is closer to the Indian Ocean and at almost 1000 meters lower altitude. 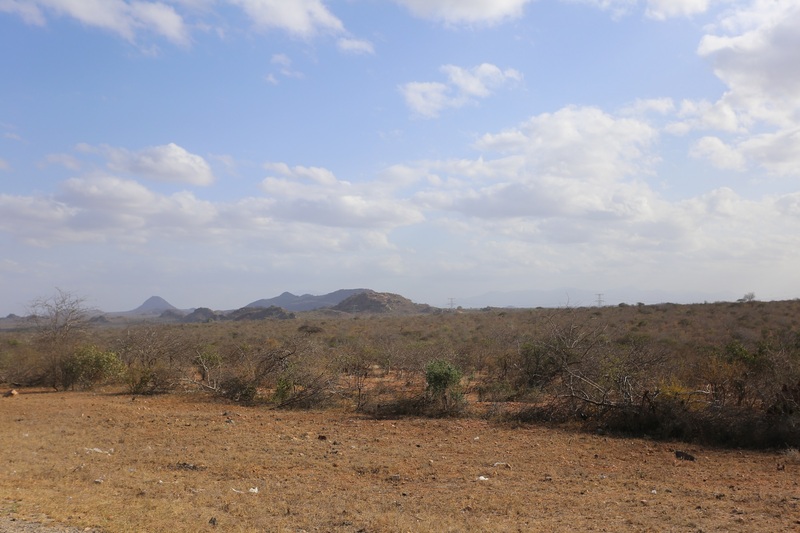 Surrounding landscape varied from lush woodland to arid savannah during the drive. Some big mammals, including elephants, giraffes and zebras were spotted by the highway. 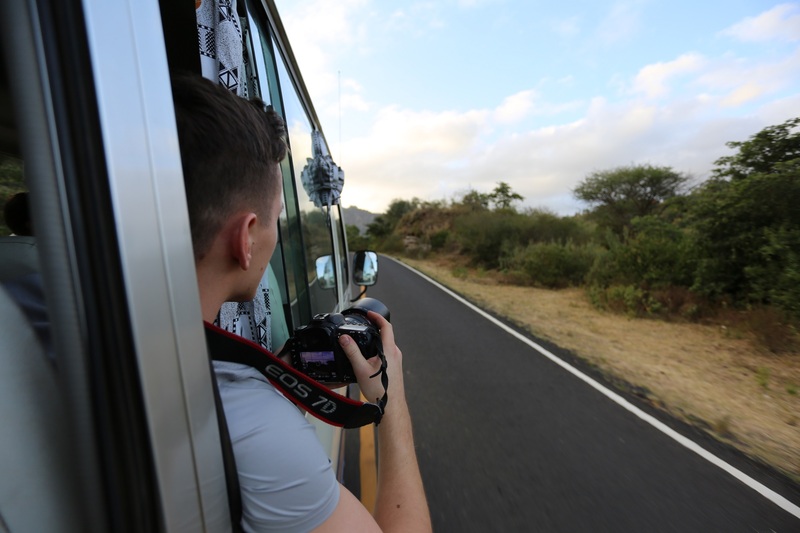 After a long day of driving, our bus arrived at the village of Wundanyi inTaita Hills at around 6pm. Timing was optimal, since there was still around one hour of sunlight remaining. We received a warm welcome from the stations staff. The rest of the evening was spend while settling down, eating a delicious meal and last but not least… sauna!